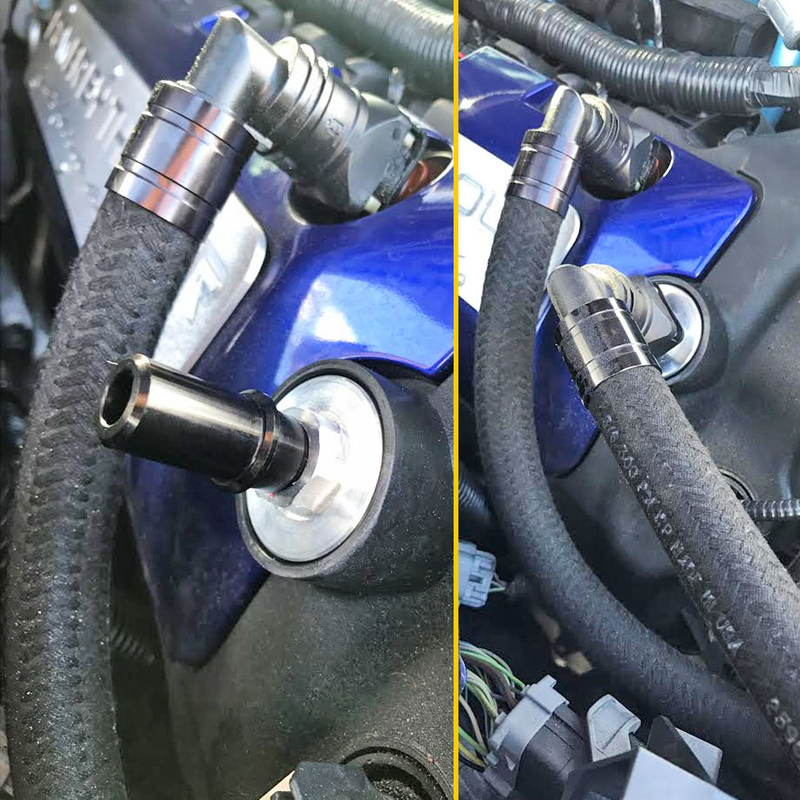 The UPR Plug N Play ™ Oil Fill Neck Adapter is the latest new product to reduce crankcase pressure without filling your intake full of oil. A must for improved PCV function and eliminating excessive crankcase pressure and or blow-by. This Oil Fill Neck Adapter allows you to eliminate running a breather filter and running the oil fill neck to a breather tank or catch can system. The reduction in crankcase pressure allows your engine to operate at maximum efficiency without messy breather filters spraying oil all over the engine bay. They currently fit 11-17 V8 and Ecoboost Mustangs along with a variety of other Ford applications. With a 1/4" NPT thread we have a selection of fitting and even a UPR Pro-Series ™ Check Valve. The fittings available are straight or a 90 degree Plug n Play™ fitting. From 3/8", 1/2", and 5/8" Plug n Play™ fittings. Installs in 5 minutes or less with 19mm wrench or deep well socket. 2011 2012 2013 2014 2015 2016 2017 Ford Mustang GT Coyote V8 5.0 Ecoboost 2.3 GT350 6.2 No one else can stack up to the bold clean styling of our aftermarket Billet dress ups, Street Strip & Racing Suspension & Performance Parts for your late model American Muscle Car!